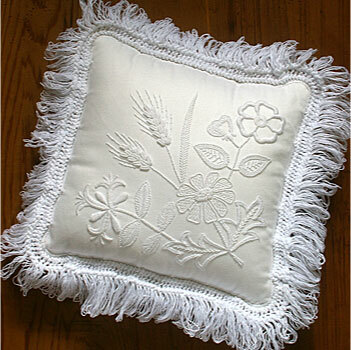 This Mountmellick Wildflower cushion features honeysuckle, wheat, dog rose and daisy. Its a sister pattern for our Dogrose and Blackberry Cushion. The two cushions together would make a gorgeous pigeon pair for your bed or lounge. Otherwise a single cushion would make a lovely focal point by itself. Mountmellick cushions are extremely practical as they are sturdy embroidery and can be washed back to white if they get dirty at all.